A few things happen this time of year. The days get ridiculously busy. So does my kitchen. But my kitchen gets busy making all kind of indulgent treats like the no bake chocolate peanut butter bars, stuffed cookies, and salted caramel chocolate chip butter bars. So I need some quick, easy meals in my life that balance out all the sweets. 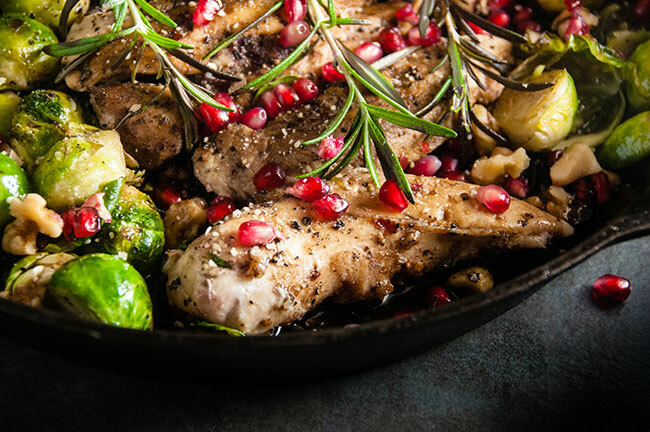 Enter this balsamic pomegranate chicken skillet. 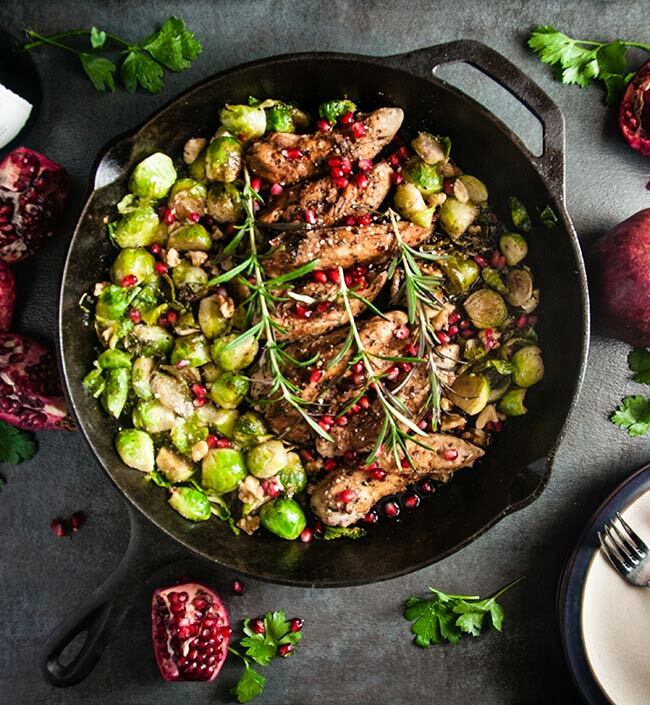 This skillet wonder is everything I need in a meal during the holiday season. It’s sort of healthy without being over the top crunchy healthy. It’s sort of sparkly and pretty because hello pomegranate jewels (insert all the heart eyes emojis). You could totally entertain with this meal, which happens so much more this time of year. 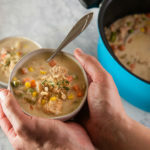 Or you could make it as a quick weeknight meal since it takes less than 30 minutes and one pan (and a pot if you are going to make quinoa with it) to put together. Really you can’t beat that for a meal during this crazy time of year. The most involved part of the prep for this is halving the brussels sprouts and getting the jewels out of the pomegranate. Something about the phrase getting the jewels out of the pomegranate definitely makes me think of pirates. 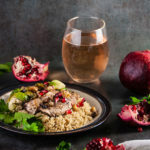 So if you’re making this meal or maybe making these pomegranate Rose spritzers consider yourself a pirate, ye scalliwag, while you get out those yummy jewels. Clearly I’m slightly unhinged today. Lots of coffee, little sleep and a slight obsession with Captain Hook on Once Upon a Time (he’s all kinds of pretty) are definitely rearing their ugly heads at the moment. 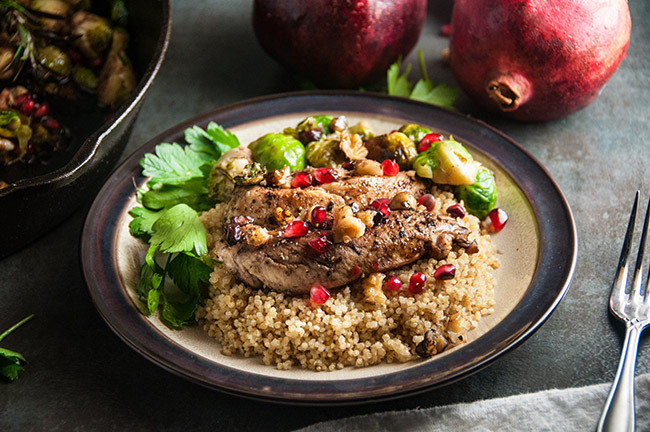 But anywho… back to this pomegranate chicken skillet. So much flavor! I absolutely adore a savory sweet tart combo and that’s what this dish is all about. It’s got a nice sweet/tart thing going on from the pomegranate, balsamic, and honey just like the goat cheese flatbreads with honey balsamic cranberries were. It’s a little spicy from the garlic and crushed pepper. And hello! The fragrance from the rosemary. OMG. So good. Kind of piney. Perfect for this time of year or really all winter long. And then the whole dish gets topped with crushed walnuts for crunch and some parmesan cheese because, obviously. It’s winning. Delicious. And makes great leftovers. Try it. Or else I may have to make you walk the plank. 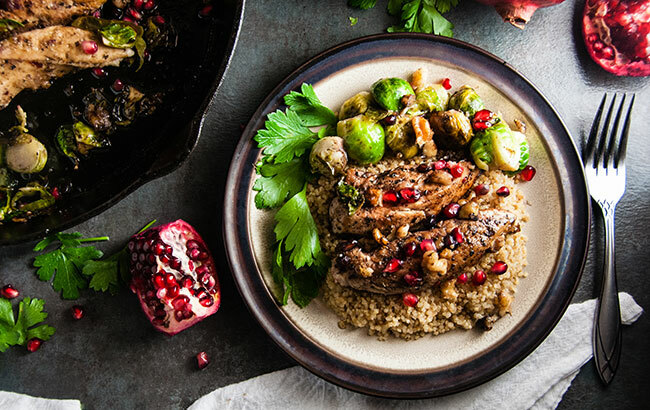 Easy Balsamic Pomegranate Chicken Skillet is a quick dinner that feels fancy and indulgent while still being fairly healthy and perfect to entertain with or for a busy weeknight dinner. Cook quinoa according to directions on the package and set aside. Heat a large skillet over medium heat. While the skillet is heating whisk together in a medium bowl the vinegar, honey, pomegranate juice, garlic, red pepper flakes, and salt and pepper. Add the chicken and set aside while you halve the Brussels Sprouts. When the Brussels Sprouts are halved, melt 1 tbs butter in the pan with a tbs of olive oil. Add Brussels to hot pan and season with salt and pepper. Cook for 2-3 minutes and flip. Move the Brussels to the edges of the pan so the center is free. Add the chicken to the center of the pan. Season with more salt and pepper if desired. Pour the remaining liquid into the pan, evenly. Cook chicken for approximately 2-3 minutes (pending thickness) and then flip. 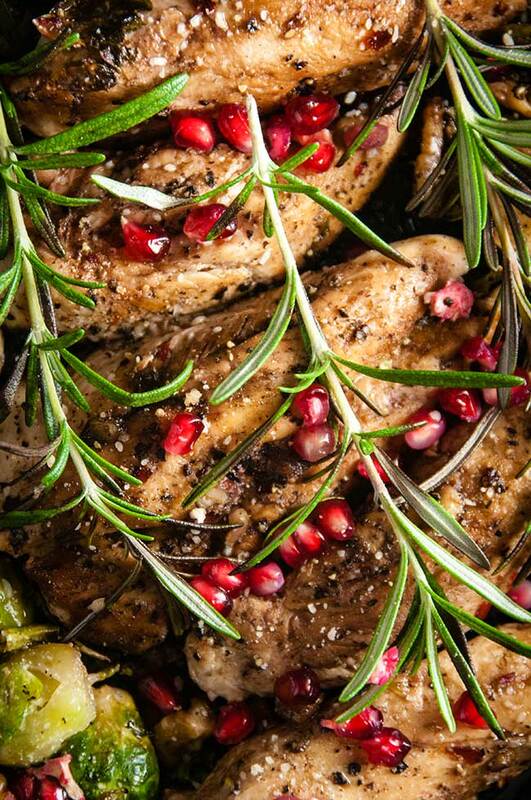 Add the rosemary sprigs on top of chicken. Cook an additional 3 minutes or until the chicken is cooked through. While cooking the chicken continue to agitate the sprouts occasionally. When chicken is just about done cooking, sprinkle parmesan over the sprouts. 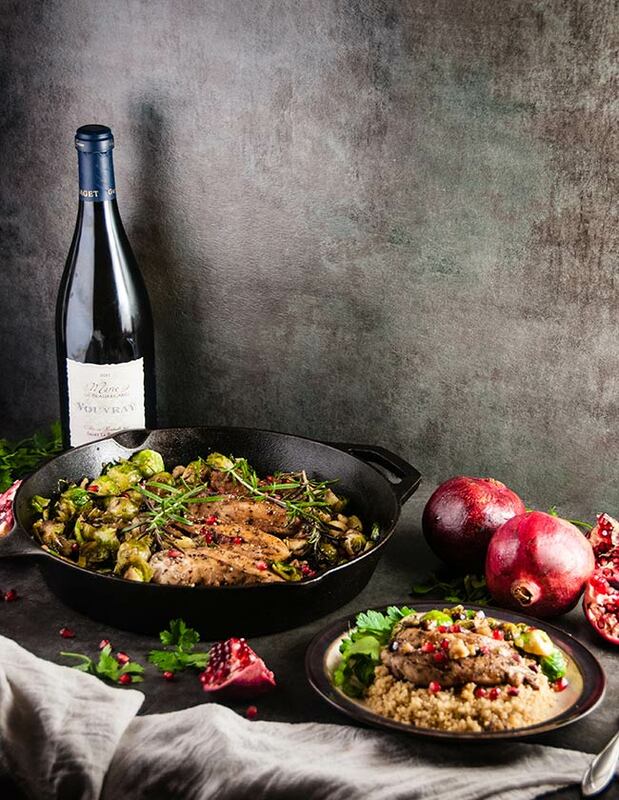 Top the entire skillet with chopped walnuts and pomegranate seeds. Serve over cooked quinoa. Quinoa is optional. 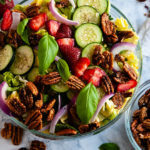 You could also serve this over rice, potatoes, or salad greens. Use whatever you like the best. 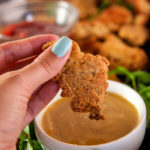 I love this recipe and love that it’s one dish! So pretty also! Might have try it soon! You have seriously made me so hungry! I definitely will be making this dish in the very near future. I think it’s a dish my whole family will love. What a gorgeous meal! Your photos are stunning. Can’t wait to try this! 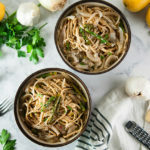 I love all the ingredients used in this! It also looks surprisingly easy to make, which is always a plus. This dish looks amazing! Perfect to serve for an intimate dinner party or when you want to impress that special someone. I will be making this for sure! This is such a beautiful dish and I know it is delicious. Great meal to make. 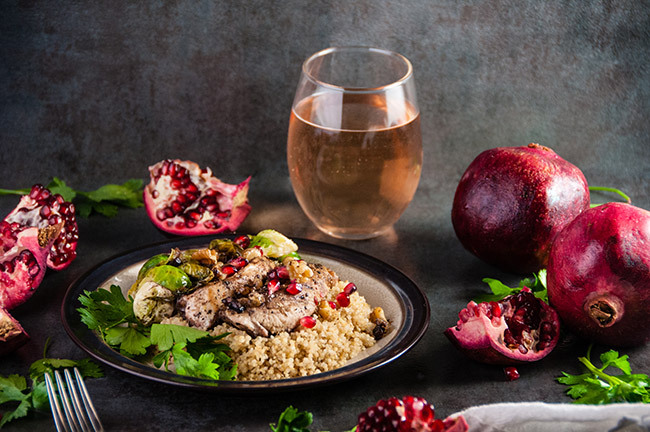 I love pomegranates and I love easy dinners – perfect match! Mmmm, this looks like all of my favorite ingredients in one dish! Such a perfect meal for this time of year. First, this is such a gorgeous dish! It looks warm, wintry, and festive. Definitely a perfect dish to make for company!